Galata's traditional houses possess grace and beauty. 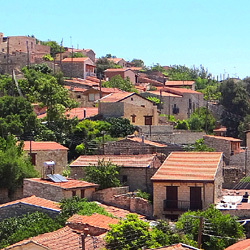 Especially impressive are the ones with the wooden balconies, houses along the central road leading to Kakopetria that had a "parkoni me parmatzia" (a balcony with a grating). Some have been reconditioned while it expected that -gradually -the rest will also be reconditioned, being under the protection of the Antiquities Department. Galata is also known as the "village of balconies" because of the many houses that had one. Almost all the traditional houses had two floors. 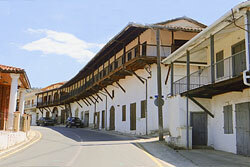 The balcony was the wooden protrusion towards the main road, about 1.5 meters in width and 2.5 meters in length, being an extension of the second floor. This protrusion, which was roofed, was supported by 3 external beams so as to be more steady and firm, having all around it the gratings at a height of about 1 meter. These were either square or rectangular wooden frames with diagonal striped pieces, one firmly attached to the other. 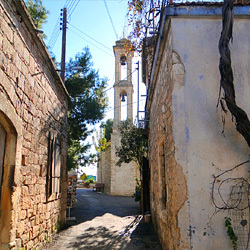 The village's older balconies are those located across the chapel of St George and they connect all the way to Maragkos's Caravansary. The owners were the teacher Lampros Hadji-Gabriel, Champis Mourtziis, Dimosthenis Kynigopoulos, and Socratis Galatis who also kept a coffee-house at the ground-floor and the Caravansary that was renovated, "Galata's Museum of Folkloric Art" being housed at its ground-floor. They were all built in 1900. Also very beautiful are the balconies to the west, some of them being reconditioned. 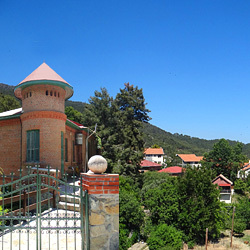 These are the ones belonging to the famous hotel of "Fysa-Nikolas", the first hotel in the Solia region, to Diogenis Georgios, to Papaloizos, and others. The balconies of Galata were at the height of their glory during the afternoons of summer. The whole family, sitting in the balcony, enjoyed the coolness of the nearby river and watched the traffic of the main street. The father rested after the day's hard work. The mother knitted or worked the loom, which most of the times was placed in the balcony. Grandma spun cotton or wool using the spindle, while the children shouted along with the neighborhood's children in the balconies next door. A wonderful painting-like image made in Galata from a few decades ago, back when Galata was the "heart of Solia" and the center of trade, of buying and selling of agricultural and stockbreeding products, and also a meeting point for the people of Solia. The rural house usually had two floors. From the foundations and up to a meter high, it was built with stones from the river or the mountain. From that point and up to the roof it was built with mud-bricks that the inhabitants of Galata made themselves. The roof either had local, curved tiles or beams, reeds, and an earthen cover, known as "domata". Over the earthen roof they would spread alluvial clay (known as "konnos") that was impermeable by the water of rain. The floor was made of brick-slabs or marble. The "mantalia" and the "romanisia" (plural, bolts - latches) were necessary for opening, closing, and securing the doors or the main gateway to the street. The stable for the animals (oxen, donkeys or horses, goats) was at the ground floor. Farther on stood the barn and then the stockroom with the large or small earthenware jars and the pitchers. 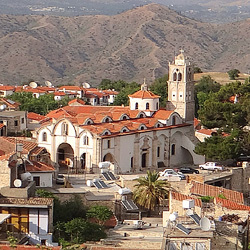 In them they stored all their produce, wheat, barley, flour, wine, "zivania" (strong, transparent, alcoholic beverage), vinegar, oil, olives, ant he "kourellos" (amphora-like pot with wide mouth) with the "challoumia" (plural, white cheese of Cyprus), and various other items. In the yard there was the oven for the baking of bread and -close to it -piles of wood, both for the fireplace in the winter and for the oven. Also essential in the yard were the "goumas" (hen pen) with the chicken and a small shed for the pig, which each family necessarily raised and fattened. The pig was slaughtered during Christmas and a part of its meat was used to make the "pasta" (dried meat), sausages, "lountza" (kind of dried meat), the "karkalamia" (the skeletal parts), lard, and "zalatina" (dried meat pieces in jelly and spices). Other meats they fried and placed in the tar-coated pitchers along with pig grease until the summer for the harvest-time. Every house had its guard, a dog, as well as one or two cats. On the second floor there were: the large room in the middle with a fire-stove and all the items necessary for the kitchen -the utensils, the dinning table, the seats -some chairs and the loom. This was the most frequented area for the family. 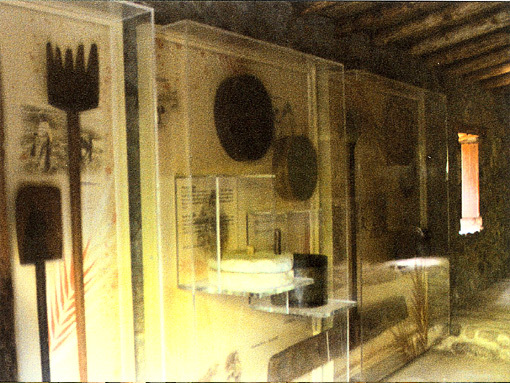 The other rooms -1,2 or 3 of them -were the bedrooms with the chests or trunks, in which all the garments, the sheets and generally the trousseaus of the family were kept. In the balconies they sat so as to rest and also entertained relatives or friends. 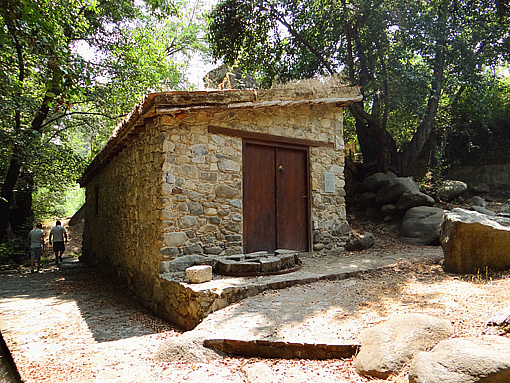 • The "Trooditissa" water mill. 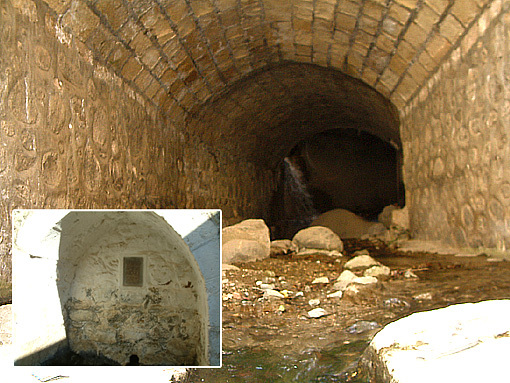 • The water mill "tou Kyrillou" (of Kyrillos), which first belonged to "Kermitzies". 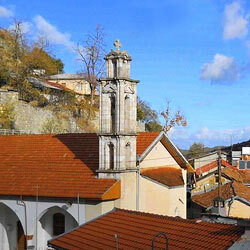 which belonged to the Monastery of Podithou. • The water mill of "Pavlaena". 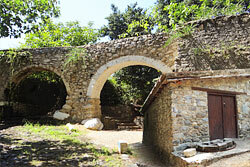 Unfortunately, the two water mills of Trooditissa and Pavlaenas do not exist today. 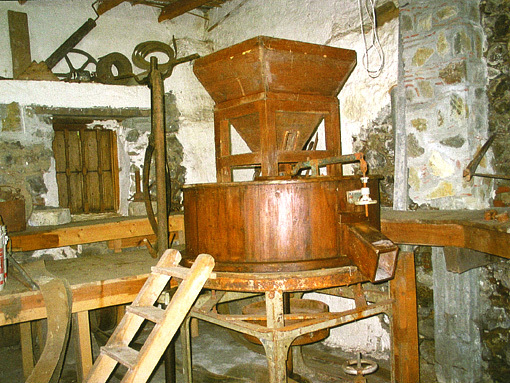 The Water Mill of "Rodou"
The water mill of "Rodou" was reconditioned in 2002 but does not operate (grind) and belonged to the Monastery of Podithou. 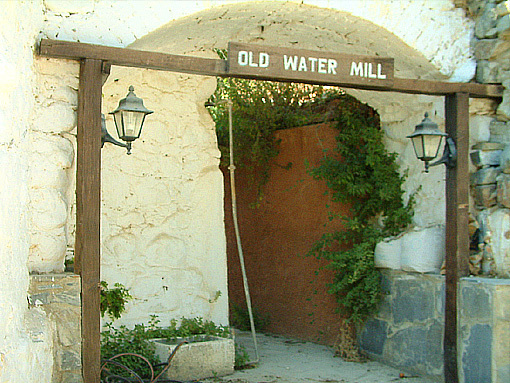 The only water mill that grinds like old times is the mill of "Kyrillos" that today stands in the middle of the village next to the Klarios river. This mill was constantly grinding until 1976. During the Turkish invasion it offered bread for both the locals and the thousands of refugees that had then swarmed the Solea region. 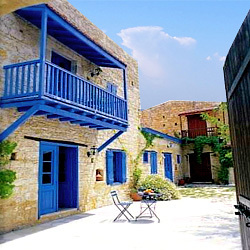 The water mill of "Kyrillos" has been reconditioned and is a point of attraction for many visitors, local and foreign. • The fountain of "Pogiatzies"
The fountain of "Pogiatzies" is located quite close to the Museum of Folkloric Art, to the right on the way to Kakokpetria. 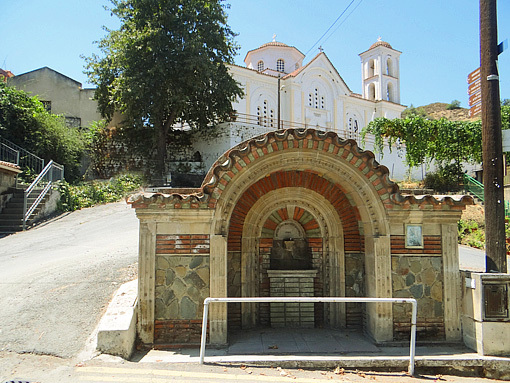 You go down some steps and face a vaulted fountain while the water of a small stream flows by your feet, coming from "Esso" (Inner) Galata and then joining with the river Klarios. At the fountain's highest point there is a built-in plate with the date 1733 and the sign "IC-XC NI-KA". 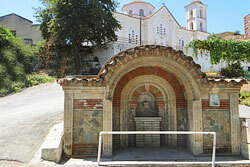 It is called "Pogiatzie's fountain" because this is where Demosthenis Loizou Pogiatzies used to wash the "vrakes" (plural, villager's pants / galligaskins) that he dyed. In those days, the white "vrakes" that they used to saw had to be dipped in a special concoction made of sulphuric copper and dry pomegranate leafs -about 4 to 5 times -until they were blackened. (Details in the book "Galata, then and now"). 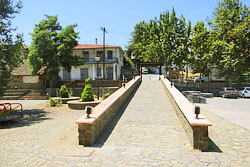 The "Mastre Philippou" (Master Philippos) fountain is found close to the village's plaza. It is the property of the dear departed Filippos Loizou. 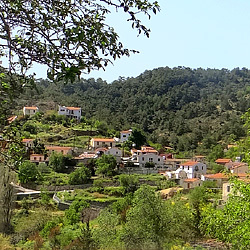 This nature trail begins from the small church of "Archangelos" (Archangel) and ends in Rodou's Mill, covering a distance of about 1 kilometre. 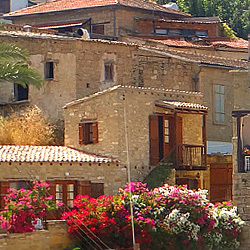 In the beginning you are walking on a trail that is parallel to a small channel made of concrete and soon you find yourself next to the river Klarios. It is a trail of exquisite beauty higher above and along the riverside. 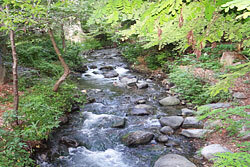 On your right you see the river flowing and hear the characteristic splashing of the water, and you see the towering trees inside the watercourse and in the riverbanks, usually being oriental alders, plane-trees, aspens, reeds, and others. 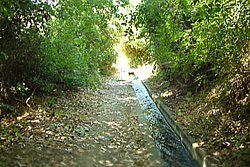 In the route from Archangel and on your left you see a drain of excellent craftsmanship, carrying water for the irrigation in the nearby tracts of land, as well as a wide range of Cyprus's flora: Myrtles, ivies, carobs, turpentine-trees, prickly bushes, walnut trees, other fruit-bearing trees and a variety of bushes and aquatic vegetation. However, once you get to Rodou's Mill with its two imposing apses, the raceway at their top where the water was transferred, since it had to be falling from up above and have enough might to turn the millstones for the grinding of the cereals, the reconditioned house of the mill, the picturesque boulders here and there, the small bridge's plaza, the thick and varied vegetation, and the twittering of the birds or the trolling of the cicada will enchant you. You will surely want to sit on the rocks and dawdle away, muse or rest, and perhaps -unwittingly -whistle a tune yourself. 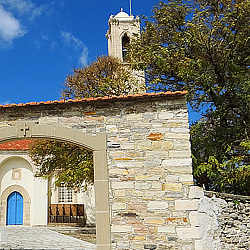 You will not regret it, if you walk through this short but entirely captivating route. It combines many things. 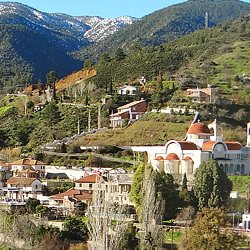 First, a pilgrimage to and a study of the Byzantine churches of "Podithou" and "Archangelos" and then the enjoyable route to Rodou's Mill. 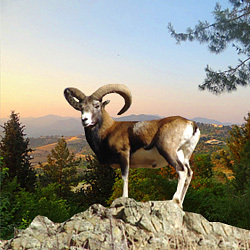 The Forestry Department has created a number of trails carefully designed to cover areas of rich natural vegetation and cultural interest. They have been landscaped on gentle gradients and are, as a rule, circular so that all age groups can easily use them. In many cases, there are signposts in place, to indicate the starting point of the trail, as well as flora and geology features along the route. 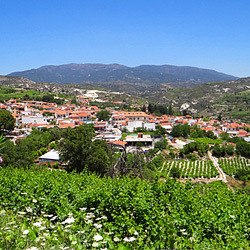 Although walking in Cyprus can be enjoyed throughout the year, the recommended seasons are during late Autumn (November) and spring, when the Cyprus rural and forest areas are at full bloom. Every year a national memorial takes place and wreaths are deposited in a ceremony in front of the monument. 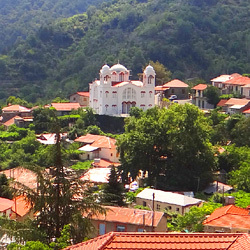 The Heroes' Monument is on our right as we enter the "Panagia Odegetria" church in the middle of the village. 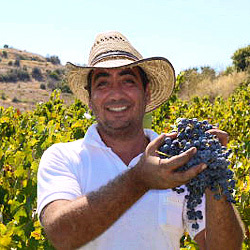 The expenses for the entire project were assumed by the brothers Andreas and Iacovos Philippou. 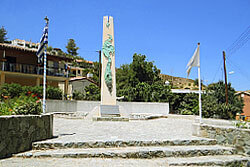 The sculptor who created the Heroes' complex is Andros Kazamias.